The first milestone meeting took place from 4 to 5 October 2016 in Heraklion, Crete. As a point of reflection on the progress of the individual partners, exchange of ideas and experiences, the meeting also served to strengthen the network of partner organisations towards a European network. The first part of the two-day workshop consisted of the presentations of the partners. Here the progress in the respective countries was presented and discussed with the entire team. This allowed the country-specific experiences and necessary adaptations to be exchanged and to plan the next steps accordingly. 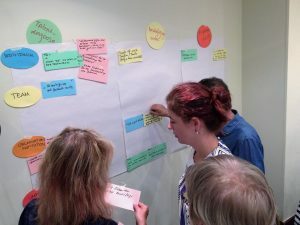 The second part of the workshop in Heraklion was filled by interactive workshops. The attending participants first worked out the potentials and resistances they expected to encounter in the further course of the project. These were summarised in overarching categories – individual level, team level, organisational level and environmental level – and evaluated through a points system. This formed the basis for the discussion on dealing with these resistances and potentials. From this strategies for the country-specific implementations were developed. The remaining time was spent on planning the self-study modules and answer questions about the further course of the project.